The story of Favara started in 2010 when notary Andrea Bartoli and his lawyer wife Florinda Saieva decided to move from Paris and restart their life in their native region, because they wanted to grow their children in Sicily. “We were tired of always having to go to places as New York or Paris to see anything interesting. We want to find a way to transform the area we were living in, for ourselves but also for our kids”, said Andrea Bartoli when interviewed by the Guardian in 2013. The situation in Favara was not simple: in June 2010 two young sisters died because of the collapse of an old building in the centre of the town, and this was due to abandon and negligence both on the part of public administration and citizens. Andrea decided to buy several empty dwellings in the Favara’s semi-abandoned centre and he thought that the maze of stone houses, with its alleys, central square and small castle were a perfect setting for an art marketplace, rather than a Sicilian Kasbah. Today Farm Cultural Park is a private cultural institution, an actual project of social and sustainable development. Farm Cultural Park is composed of seven courtyards linked together with small buildings and few small gardens that create a centre of contemporary art. More specifically there are 3 art galleries and a set of exhibition spaces such as: Farm-young-art, Bartoli-Felter Foundation, Artegiovane Sicilia, Terry Richardson Fan Club and Uwe Jaentsh Museum. 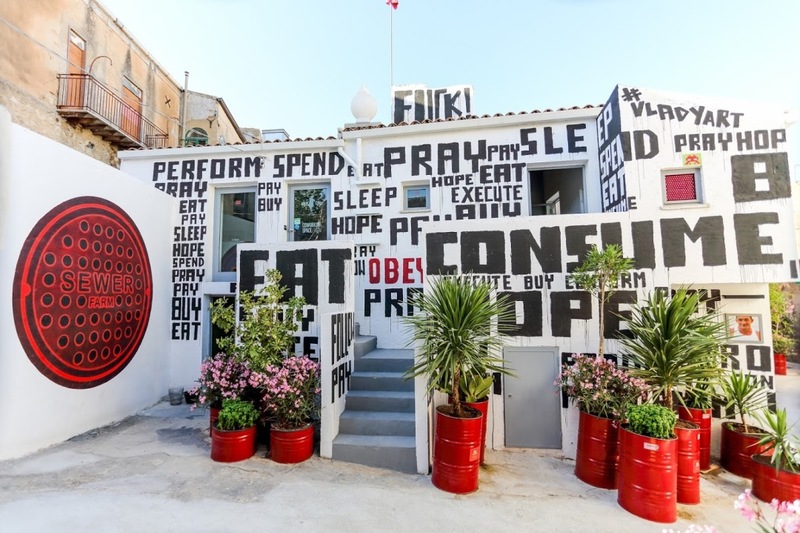 There is also a centre for contemporary architecture, the Sicily Foundation and a set of buildings dedicated to the residency of artists, designers and architects that curate temporary projects. Additionally, there are libraries, spaces for meeting, parties, events, language labs, educational departments for adults and children. Several collateral services related to food (unconventional restaurants as space ‘Nzemmula’), hospitality (diffuse hotel) and mobility (bike renting) are provided. The key-players are Andrea Bartoli and Florinda Saleva, the founders of Farm Cultural Park and real heroes of the initiative: two simple citizens who decided to invest energy and money in restoring the centre of Favara and create an open-air art gallery. Another crucial group of actors is composed of all the artists that participate to transform the public space by experimenting several types of creative residency within the town. In addition, residents of Favara are protagonists of this initiative because they contribute in welcoming visitors and artists, making the place pleasant and comfortable. Among the citizens, there is a group known as FUN (Favara Urban Network) formed by young volunteers that contribute in animating the town centre. Later, some other friends join Andrea and Florinda in financing the town centre restoration, creating a sort of philanthropic community to support Farm Cultural Park. In a way, Farm Cultural Park made a quite explicit use of design, because everything is designed, at different scales: from the buildings to the objects, to the signage, to the food, the design thinking approach is evident even in the words of the founders Andrea e Florinda. Design is combined with art and architecture, without clear boundaries and this is an holistic perspective that is applied to the whole town centre of Favara. > Public space design: in the care and regeneration of buildings and urban commons in general, what characterizes Farm Cultural Park is the original use of the courtyards. This re-interpretation of the public space is done by artists who often involve residents in their activities time by time. > Communication design: in a way Farm Cultural Park develops a sort of ‘ global territorial communication’, from the signage to the public art developed directly on field.